Heat a sauté pan over medium heat. Add 1/2 cup cubed pancetta and sauté until cooked. Remove from pan to a medium bowl to cool. Once cool, add 3 eggs, 1/2 cup heavy cream, 1/2 cup milk, 1 tablespoon fresh thyme leaves, 1/2 teaspoon salt, 1/2 teaspoon ground black pepper, 1/8 teaspoon nutmeg, 1/2 cup gruyere cheese and 1/2 cup ricotta cheese to the bowl with pancetta and whisk together. Unroll Pillsbury™ refrigerated crescent dinner roll dough into 4 rectangles and press seams from tri-angles together. Place each rectangle into individual buttered tart pans or ceramic baking dishes, pressing extra dough up the sides of the pan. Prick bottom with a fork. Pour egg mixture into each tart pan or ceramic baking dish, filling each almost to the top. Bake for 25-30 minutes or until crust is golden brown and the egg mixture is fully cooked. Let cool about 10 minutes before serving. Toss together some salad mix, tomatoes, 1 tablespoon olive oil and salt and pepper to taste. 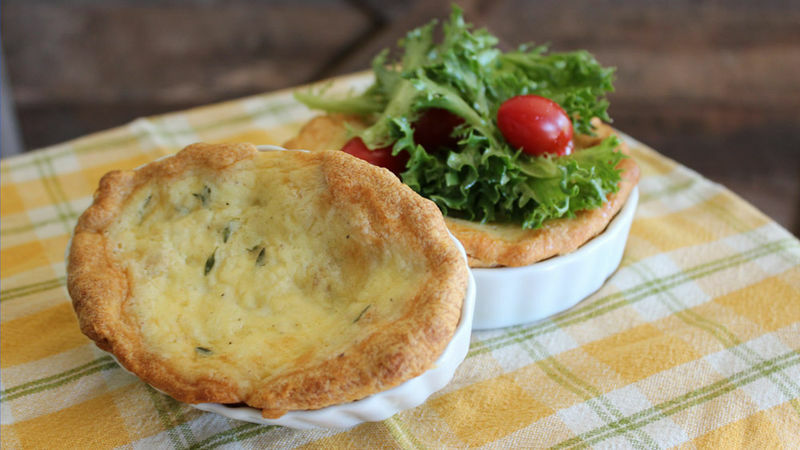 Serve with salad on top of each quiche, if desired. You could also bake this in 1 Pillsbury™ Refrigerated Pie Crust (baked according to package instructions) instead of making individual quiches.